As the winner of Business Park of the Year in the Thames Valley Property Awards 2017, Howbery Business Park in Oxfordshire is proud of its reputation and its beautiful tree-lined campus on the banks of the River Thames in Wallingford. The Park – the UK’s first solar powered business park – is home to over 50 businesses and organisations, employing more than 800 people, ranging from small companies to large corporations, including independent civil engineering and environmental hydraulics specialist HR Wallingford, and the Environment Agency. Overseeing waste management on the entire site is Estates Manager Donna Bowles. She works with Grundon Waste Management and recently teamed up with Grundon account manager Jon Hammond and office support Tracy Richardson to further improve segregation and recycling on site. 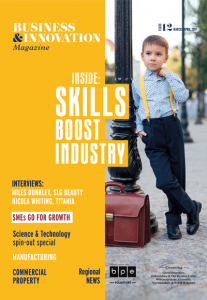 It was after reading an article posted online by Jon about how Grundon services Oxfordshire-based BRITA, a world leader in water filters, that Donna was encouraged to look for even greater opportunities. “We have done a lot with Grundon already and I am very happy with their services, but I am always keen to find out if there is something more we could be doing,” said Donna. One of the biggest changes was to take away all of the park’s office desk bins and replace them with 100 corridor bins – 50 for general waste and 50 for mixed recycling – ensuring people have to think twice when disposing of their office waste. As well as the waste management portfolio, Donna and the Estates Team look after areas such as catering, security, ground maintenance and cleaning. The cleaning team provides a vital role in helping with waste management because they are responsible for collecting the waste from tenants’ bins and taking it back to the larger waste container locations supplied by Grundon. Around the Park, there are a mixture of compactors, rollonoffs and containers for different types of waste. This includes general waste (non-recyclable) which is sent to Energy from Waste (EfW) facilities, where it is converted to green energy and distributed to the National Grid; scrap metal, which goes for reprocessing and earns a rebate to be offset against waste charges; and mixed recycling – such as plastics, paper and card – which is also sent for recycling and reprocessing. The majority of hazardous waste goes into a special Grundon WEEE (Waste Electrical and Electronic Equipment) cage for collection by a dedicated hazardous waste vehicle for onward transportation to Grundon’s Hazardous Waste Transfer station for correct disposal. Items not disposed of by Grundon will go directly back to their original supplier. Confidential waste is handled by Grundon’s partner Shred Station, which provides shredding services and provides a certificate of destruction. Jon Hammond said: “Howbery Park is zero waste to landfill and was already very successful in what it had achieved, but there is always room for improvement and, with our help, that’s what Donna wanted to aim for. 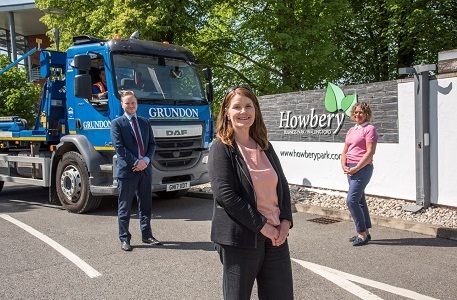 With further new Grundon plans on the horizon, Donna says she is always keen to support local providers and, in addition to being impressed by the services, also likes the fact that Grundon’s collection fleet is CarbonNeutral® thanks to its carbon offsetting programme with Natural Capital Partners.